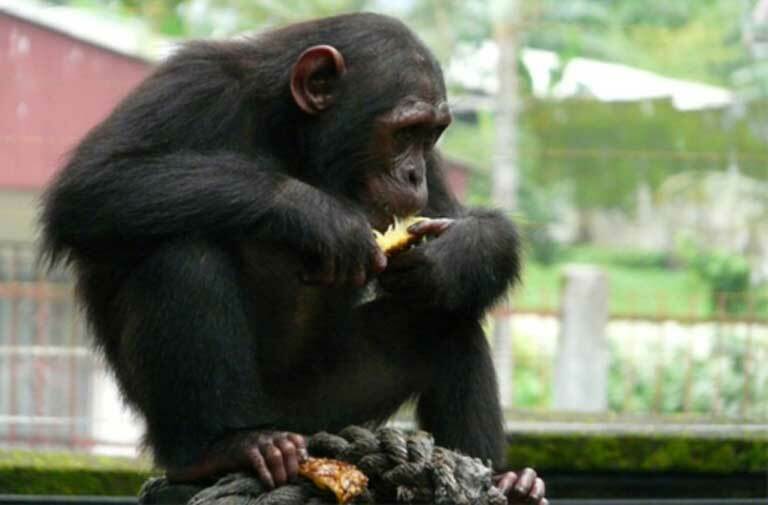 The Endangered Nigeria-Cameroon chimpanzee (Pan troglodytes ellioti) is the least numerous subspecies of chimpanzee, with a total population almost certainly less than 9,000, and probably less than 6,000 individuals. The estimated population is far smaller in Cameroon, where just four known populations number some 250 individuals, all located in the Northwest region. One of those groups, known as “The Great Apes of Tubah” was until recently found in the unprotected Kejom-Keku Mountain Forest. But the chimps haven’t been seen in three years, and conservationists fear they’ve been killed or forced to move on. 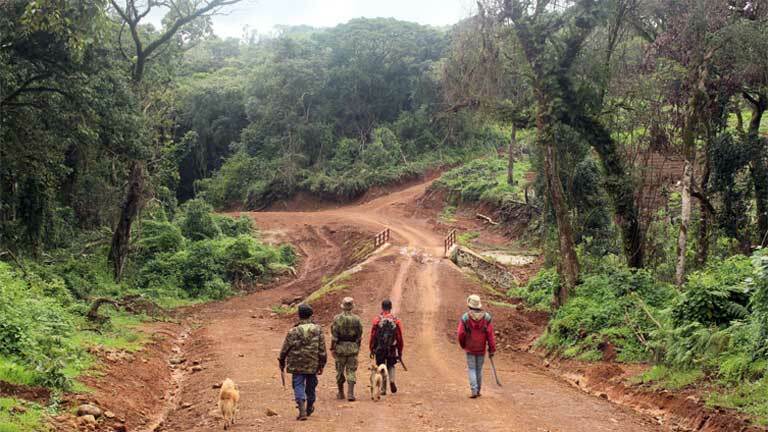 A new road into the Kejom-Keku area has resulted in the loss of half its forest, as herders, farmers, loggers and poachers move in. BAMENDA, Cameroon – A group of rare chimpanzees have gone missing from a mountain forest in Northwest Cameroon, say researchers, raising fears concerning their welfare as the animals are exposed to major deforestation and to poachers and loggers largely due to the construction of a widely criticized government-sponsored road project. Scientists still don’t know much about the missing chimps. A camera trap caught the first and last glimpse of the great apes, amongst the world’s rarest and least studied, in 2014. Since then, existing nests have aged away. The small group nicknamed “The Great Apes of Tubah” appears to have vanished. “They have either been killed or forced to migrate,” speculates conservationist Martin Mikeš. He runs the Kedjom-Keku Organization, an NGO that has been informally monitoring the animals for more than five years. “No one knows what has happened to them,” he says. Mikeš’ worst fear is that the rare animals have been driven locally extinct, like the elephants and buffalo that once inhabited the forest. In the three years since the primates went missing, he says, more than half of the remaining forest, forming parts of the Bamenda Highlands, has disappeared. 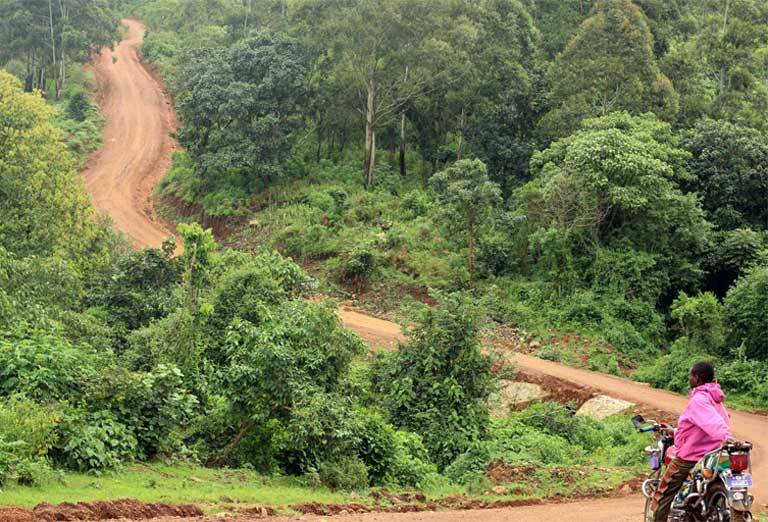 A new road built principally to encourage agricultural expansion has accelerated habitat loss and given poachers and timber exploiters access to the higher mountain altitudes and to more remote woodlands, says Mikeš. If there is no action, in another five years, he warns, there could be no forest left in the area. Pan troglodytes ellioti is perhaps the rarest of all subspecies of chimpanzee and one of the least studied, according to Osiris Doumbé, a wildlife biologist, conservationist and lecturer at the Bristol Zoological Society. Populations are confined to lowland and montane forests running from western Cameroon into southeastern Nigeria. The estimated population is far smaller in Cameroon. The country hosts just four known populations of Nigeria-Cameroon chimpanzees, some 250 individuals, all located in the Northwest region. The subspecies has been locally extinct in the Kimbi Wildlife Reserve and the Kilum-Ijim forests since the late 1980s, says Doumbé. He surveyed the Kedjom-Keku forest in 2013 and was the principal investigator of the Ellioti Project in 2014 and 2015, which mapped the relative distribution of Pan t. ellioti in Cameroon. “Amongst the total four populations of chimpanzees [in Cameroon], the most threatened is no doubt the Kedjom-Keku community with an estimate of less than eight individuals in 2013, which is isolated from other chimpanzee populations,” says Doumbé. “The Northwest is well-known for its agriculture and plantations, but much less for its wildlife which has greatly decreased in the last century, and several large mammals have been extirpated [such as] elephants, leopards and lions,” explains Doumbé. “The Cross-River gorillas are now restricted to Kagwene Gorilla Sanctuary, and the chimpanzees are gathered in isolated communities. [Threats include] hunting pressure, mostly close to the international border with Nigeria. At more than 2,000 meters (6,562 feet) above sea level, the Kedjom-Keku Mountain Forest is often shrouded in mist. A freshly built road cuts through that forest – a brick-red snake weaving through lush forest, passing cold pristine streams, mountain pastures as green as golf course fairways, along with newly opened croplands that grow Irish potatoes, corn and vegetables. For centuries, dense forest, rugged terrain and a cold wet climate made the forest inaccessible, helping protect its wildlife. The mountain’s Fulani pastoralists and indigenous hunter-gatherers barely made a visible impression on the natural landscape. But, steadily, as the population grew in the villages bordering and within the mountainous terrain, demand for arable land increased and human encroachment expanded. Slash and burn agriculture drove deforestation, habitat loss and the destruction of watersheds. In the search for more grazing fields, herders began cutting and setting forests on fire, transforming swaths of woodland into grasslands more suitable for their cattle, according to local inhabitants and conservation workers. 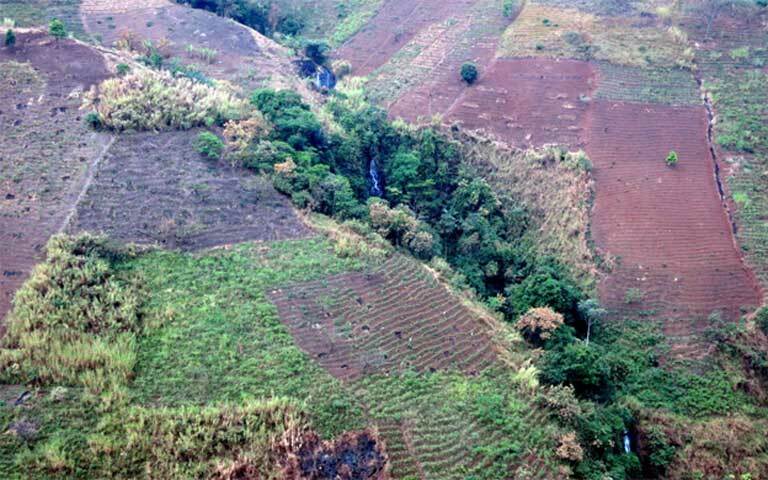 “[In the past] there was a clear demarcation between grazing land, farms and forests,” says Kemie Christopher, a community volunteer working with the Kedjom-Keku Organization. As a child, he accompanied his father into the forest to hunt antelope. As an adult, he says he can’t remember the last time he saw one alive. Locals say that over time the mountain’s animals diminished then disappeared, hunted or driven out by habitat loss. In the local community, a handful of trophies – skulls, horns and skins – are the only evidence today of the forest’s former wildlife wealth. It was packaged as a poverty fighting initiative, a way of expanding opportunities for mountain and forest dwellers. The road is one of the ministry’s Grassfield Participatory and Decentralized Rural Development projects (GP-DERUDEP), a program that receives funding from the Africa Development Bank and the World Bank. In the months following the road’s completion, hundreds of outsiders – farmers, poachers and timber exploiters – moved into the forest. Rich city dwellers, including prominent lawyers and businessmen, bought swaths of trees, most now leveled to grow maize and vegetables. Thanks to the new road, farmers can now drive or ride deeper into the forest, bringing in more labor and high impact clearing equipment including chainsaws and bulldozers. The use of agricultural chemicals has gone up too, polluting rivers and groundwater, says Mikeš. Agricultural production is way up in the region. The Tubah Administrative District, in which the Kejom-Keku Mountain Forest is located, is now a leading producer of huckleberries, a local staple and highly prized in the big cities because of its high fiber, low water content, dark-green color and unique bittersweet taste. The government-run Institute of Agricultural Research for Development (abbreviated IRAD in French) has now opened many hectares of potato experimental farms deep in the forest and plans to introduce new crop varieties on the mountain. Corn and vegetables produced here now sell as far away as Gabon and Equatorial Guinea. But as agricultural productivity has soared, habitat has vanished and wildlife has been devastated, says Mikeš. 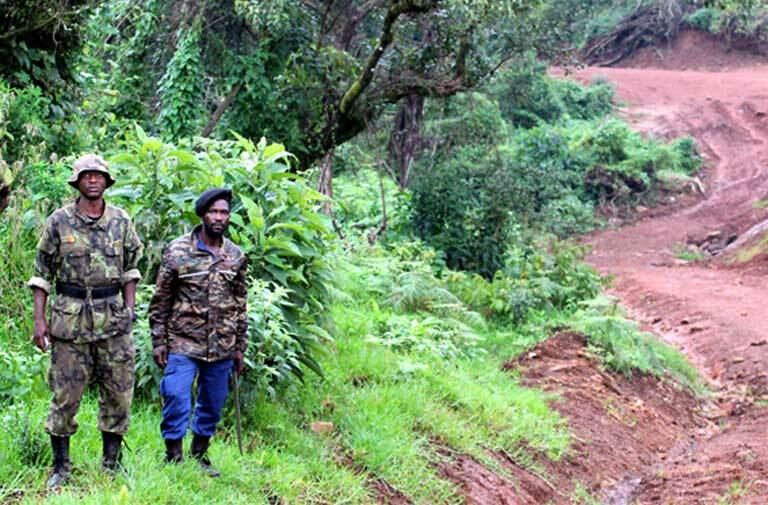 The Kedjom-Keku Mountain Forest was never protected by the government, despite its rich biodiversity and its hosting of an extremely rare subspecies of chimp. For that reason, efforts to conserve the forest and its wildlife have been at best marginal, led mostly by individuals like Mikeš and by lone NGOs or researchers. What conservation work that is getting done lacks the support of local authorities, who often appear to be benefitting financially from the land grab unfolding in the forest. 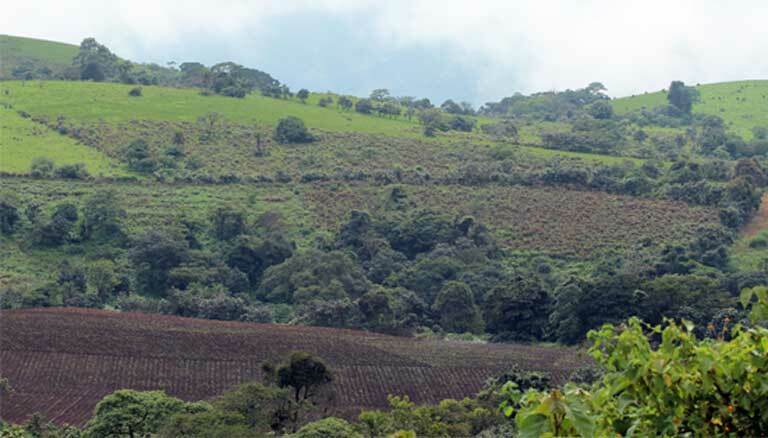 Municipal and administrative officials turn a blind eye to the massive deforestation taking place and sometimes sanction large farm deals, according to volunteer rangers. Traditional authorities, once custodians of the forest, have become either complacent or helpless. Over time, inhabitants of surrounding villages have made incursions into forested areas, clearing land for crops or cattle, and then claiming it as either part of their ancestral heritage or as “no man’s land,” where occupation is based on a first-come, first-served basis. As a result, land conflicts and violence are on the rise. Mikeš says the biggest problem in the remaining forest is the absence of law enforcement. 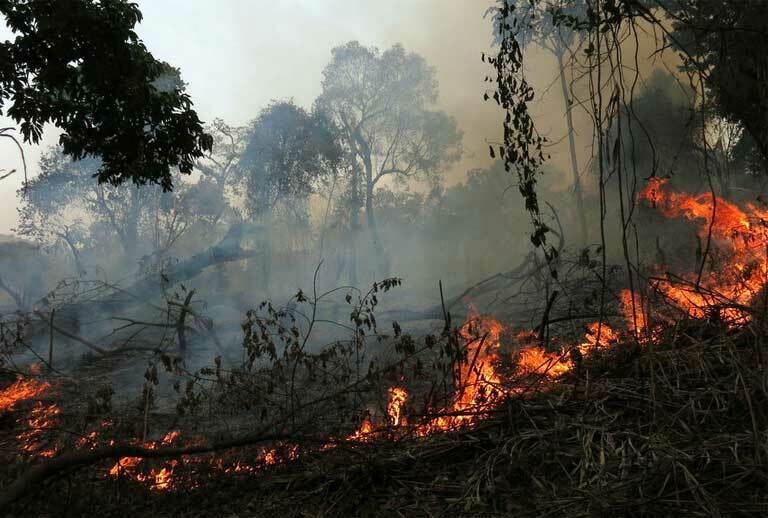 Though the forest has not been formally conserved, laws that could limit deforestation are not being enforced, including the banning of bush fires and the clearing of waterways and catchments. Vested interests – including wealthy individuals, the political elite and tribal groups – have rendered forest protection and wildlife conservation risky. Twice in the past year, gangs of thugs set fire to Mikeš’ forest camp, hoping to force him out. Rangers say they have been attacked during patrols and are now forced to carry machetes and other rudimentary weapons to protect themselves. Despite the dangers and a lack of government support, the few conservationists working in Kejom-Keku Mountain Forest are determined to preserve the remaining forest and wildlife. Doumbé emphasizes the need to find the missing chimpanzee group, if it still survives, and to preserve the great apes along with their habitat. “Chimpanzees are what we call a keystone species,” he says. “Their role in the tropical forest is crucial as they disperse the fruits of dozens of tree species and participate in the regeneration of the forest. Without them, many species of trees would struggle to disperse their seeds and would eventually disappear. “Also, chimpanzees have always been a part of the traditions of people living around them. They represent the wisdom and the cleverness in many traditional tales,” he says. Protecting the chimps is also important for science, adds Doumbé. “The Nigeria-Cameroon chimpanzee (also called Elliot’s chimpanzee) is – as it names reveals – only found in Nigeria and Cameroon. It is the least known and rarest of all four subspecies of chimpanzee. Therefore, there is still so much to learn from this taxon. 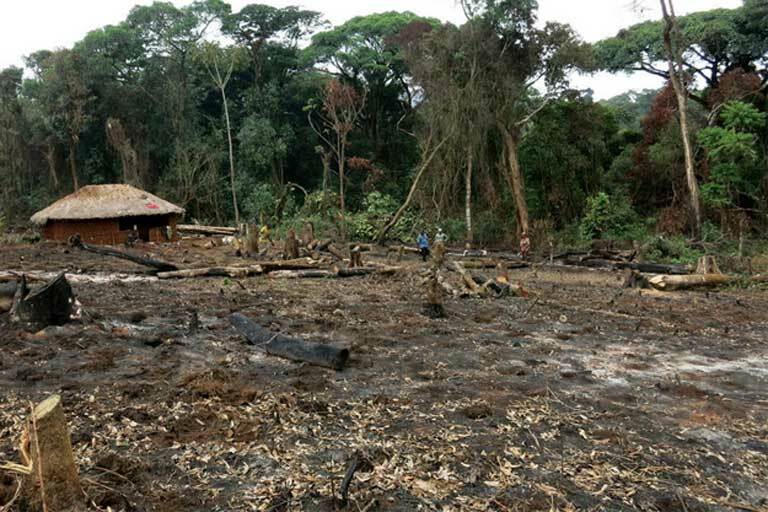 Doumbé’s hope may be forlorn: the massive deforestation taking place in the unprotected Kejom-Keku Mountain Forest, if not stopped, could mean that the missing Great Apes of Tubah, should they be found, may not have a forest to come home to. Doumbé OA. (2013), Habitat Mapping of the Babanki-Finge Forest, and Survey on the Rarest Chimpanzee (Pan troglodytes ellioti) in the Bamenda Highlands, North-West Cameroon. MRes Thesis: University of Roehampton, London, UK. Oates, J.F., Doumbé, O., Dunn, A., Gonder, M.K., Ikemeh, R., Imong, I., Morgan, B.J., Ogunjemite, B. & Sommer, V. (2016). Pan troglodytes ssp. ellioti. The IUCN Red List of Threatened Species 2016: e.T40014A17990330.